In patch 4.3 you’ll be able to customise the appearance of your weapons and armor like never before. The Ethereals, emerging from the nether, will bring with them a new technology they call Transmogrification. They’re heading to the capital cities of Azeroth to set up shop and to offer adventurers a unique service – copying the appearance of one magical item onto another. They only ask for a modest gold donation to recoup their costs. 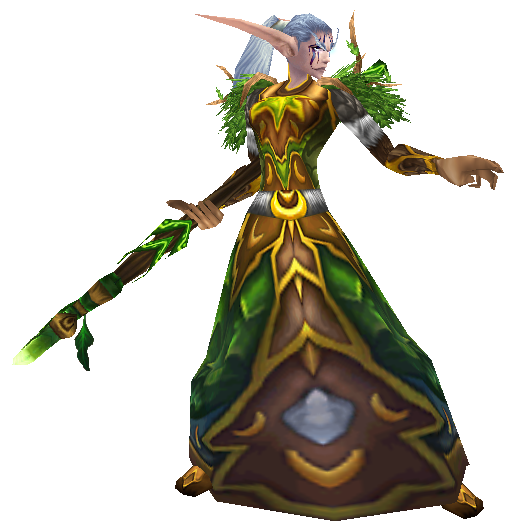 Visiting a Transmogrifier will present players with a new interface that will allow them to change the appearance of an item while retaining its original stats. That’s Wildfury Greatstaff; Cenarion Spaulders and Gloves; Stormrage Chestguard, Belt, Legguards, Boots and Bracers; helm and cloak hidden, which is something I normally do anyway. And something including the Cursed Vision of Sargeras (and pants rather than a skirt) for DPS, assuming I can get Illidan to cough the damn thing up already. The Void Storage is a new type of bank where players will be able to store their old armors in order to free up space in their regular bank. You have no idea how much space this feature will save me. …actually, let me give you an idea. If we go by “soulbound weapons and armor only”, not counting trinkets, necklaces, rings and assorted toys (such as the stuff from Archaeology, dice, etc, etc), I would be able to drop 114 slots’ worth of items into Void Storage. More if by the time 4.3 comes out I’ve replaced T11 items entirely. That’s a little less than two thirds of my total bank capacity. This would be so awesome. Threat generation for all tanks has been increased to 500%, up from 300%. This applies to warriors in Defensive Stance, death knights in Blood Presence, druids in Bear Form, and paladins with Righteous Fury. […] It’s not fun to feel throttled. It’s not fun for the Feral druid to stop using special attacks in order to avoid pulling aggro. It’s fun to use Feint at the right time to avoid dying, but it’s not fun for Feint to be part of your rotational cooldown. We want you to spend most of your effort trying to overcome the dragon or elemental, not struggling against your own tank. Tanks are busy. […] We ask tanks to do a lot — everything from picking up adds, to moving bosses around, to staying out of fires, to providing interrupts, in addition to the classic tank roles of staying alive and generating threat. […] However, this system fails and often spectacularly so when it’s the tank who is the undergeared player. Even if a competent healer can keep the undergeared tank alive, the fully raid-geared DPS spec is going to constantly be on the verge of pulling threat. That’s not an issue of skill. It’s just numbers. It’s also not a problem that is easy to overcome for either the overgeared DPS or the undergeared tank — it’s just not a lot of fun for anyone. …as if millions of ferals suddenly cried out in terror and were suddenly silenced. I fear something terrible has happened. We’re keeping a close eye on Feral in PvP and understand the concern. Things currently on our radar include the Berserk duration, the Unheeded Warning trinket, and the Predatory Swiftness talent. Unheeded Warning is both a PvE and PvP problem. The particular mechanics of the trinket keep it disproportionately powerful for Feral druids. I guess “we’re keeping a close eye on Feral in PVP” meant “we’re going to hotfix-nerf Unheeded Warning without even mentioning it anywhere, because we think it’s fun for players to figure these things out by themselves”. Unheeded Warning has been changed from a 680 weapon damage proc to a 1926 AP proc. And yes, I went and punched a dummy naked until I got it to proc for science to get confirmation. Meh. On the one hand, this puts it in line with other trinkets of the same ilvl. On the other hand… mehhhhhh. Don’t mind me, I’m still in the “bitter about feral PVP” corner. The one where we feel that if rogues can keep you or your healer chain-stunned while they burst you down, that’s fine, if retadins can do more or less the same, that’s terrific, if you can’t kill holy paladins or make them go OOM no matter how hard you try, that’s brilliant – but heavens forbid ferals might actually be able to be decent at PVP.